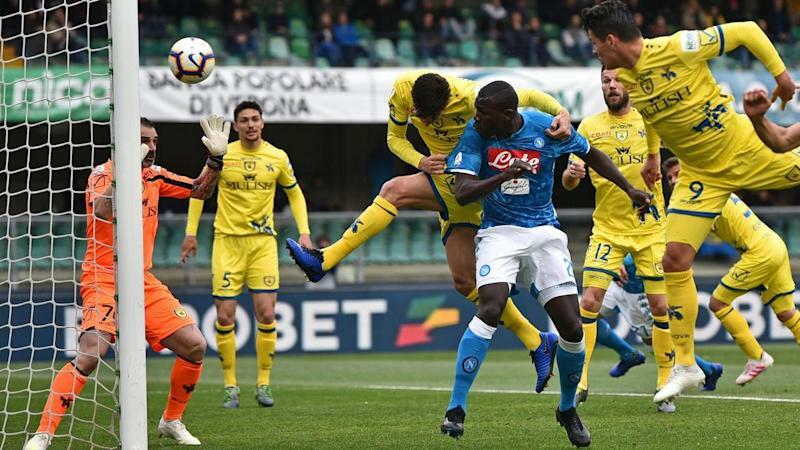 Kalidou Koulibaly has scored a brace as Napoli won 3-1 at Chievo, dooming them to relegation while putting off title celebrations for Italian Serie A leaders Juventus. With six games remaining, the Neapolitans lag 17 points behind Juventus, who lost 2-1 at lowly SPAL on Saturday, failing to get the single point they needed to clinch a record-extending eighth successive championship title. Second-place Napoli, who have a worse head-to-head record with Juventus, have all but secured one of four available European Champions League places. Chievo head for the Italian Serie B after 11 straight top-flight campaigns. They had three points deducted early in the season for irregular bookkeeping. The Neapolitans' defender Koulibaly nodded home his first goal of the season on Sunday and fired home a second after Arkadiusz Milik's clinical drive. Bostjan Cesar headed in a late consolation goal. "I have been after a goal since the start of the season," Koulibaly said. "Today I even got two and I am happy about it, mostly because we won. Today we wanted to win because we missed the three points in the league (after a loss and a draw)." Third-placed Inter Milan closed the day's program with a 3-1 win at second-bottom Frosinone. Radja Nainggolan headed in, Ivan Perisic converted a penalty and Matias Vecino secured victory after Francesco Cassata pulled one back for the hosts, who sit eight points off safety. 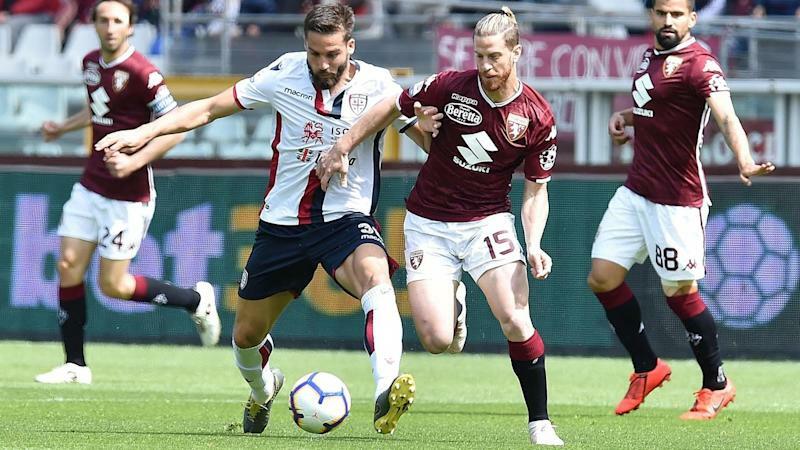 Earlier in Turin, 10-man Torino drew 1-1 against Cagliari, who had two men dismissed. Torino's Simone Zaza was on target in the 52nd minute before being red-carded for insulting the referee on 73. Five minutes later Leonardo Pavoletti levelled with a header after a video assistant referee review ruled out an initial offside call. Cagliari's Luca Pellegrini exited with a second booking on 82 and Torino coach Walter Mazzarri was dismissed for his protests before Nicolo Barella was also sent off in stoppage time. Torino are two points off the Europa League zone and five adrift of fourth place, the last European Champions League spot. Mid-table Cagliari are nine points clear of the relegation zone. Genoa also had a man sent off as they lost 2-0 against Sampdoria in a city derby that saw league top scorer Fabio Quagliarella on target for his 22nd goal of the campaign with a penalty goal. Gregoire Defrel had earlier given Sampdoria the lead with a flick off a low cross from Quagliarella. Fiorentina and Bologna drew 0-0 in pouring rain in Florence, where Vincenzo Montella began his second spell in charge. Sassuolo and visiting Parma also played out a scoreless draw in a regional derby as Fabio Ceravolo missed a penalty for the away side. Saturday action saw AC Milan beat Lazio 1-0 to stay fourth, one point above Roma, who edged Udinese 1-0. Atalanta can draw level on points with Milan by beating struggling Empoli in a fixture on Monday.